Tom Lenk. Photo: Lanny Nagler. Imagine what it would be like to work with Barbra Streisand. Now imagine how really bizarre that experience might be if you got to work as a make-believe store clerk in a fairytale shopping mall located in the basement of her sprawling California home. That’s the premise of Jonathan Tollin’s very funny Buyer and Cellar getting a run at TheaterWorks starring “Buffy the Vampire Slayer” star Tom Lenk (directed by Rob Ruggiero, assisted by Eric Ort). Looking for his next gig, aspiring actor Alex More (Lenk) gets his big break – playing a shop clerk in the underground shopping mall constructed by Streisand to house all of her prized collections. There’s a costume shop, an antique store, a doll shop and even an ice cream parlor. When More isn’t bored, sitting around dressed like an old-fashioned shop keeper waiting for his only customer (Barbra likes to pretend she is shopping), he’s telling boyfriend Barry details of his experiences with the queen of the pop charts, her husband, James Brolin, and the estate’s manager. When Alex wins Barbra’s trust after an odd haggling session about the price of a doll that blows bubbles, he becomes her friend/confidant/script-line-reader. At least for a little while… Because after all, how close can a struggling actor really get with such a star? Sitting on a chaise lounge surrounded by the walls of his apartment (design by Luke Hegel-Cantarella with projections by Rob Denton that show us glimpses of the basement set-up) the actor relates his feelings about the experiences while depicting all of the characters (though don’t think Streisand impression). 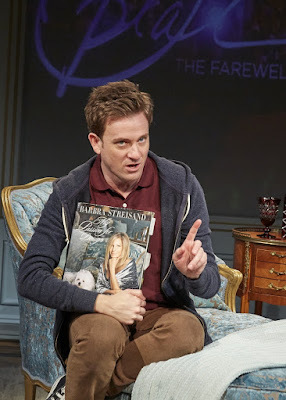 Lenk gives More a very gay persona (a different take from Michael Urie, who charmed New York audiences in two Off-Broadway productions of the show in 2013). We smile as Lenk gushes with excitement and puzzles with angst over working for Barbra. We chuckle and guffaw over the bizarre situation and exchanges between buyer and seller. Buyer and Cellar runs through Feb. 14 at TheaterWorks, 233 Pearl St., Hartford. Peformances are Tuesdays, Wednesdays and Thursdays: 7:30 pm; Fridays and Saturdays: 8 pm; Saturday and Sunday Matinees at 2:30 pm. Wednesday Matinees Oct. 15 and 21 at 11 am. Tickets $15-$65; 860-527-7838; www.theaterworkshartford.org.